No need to guess when your next bus or train will depart. * NexTrip gets you what you need, right now! 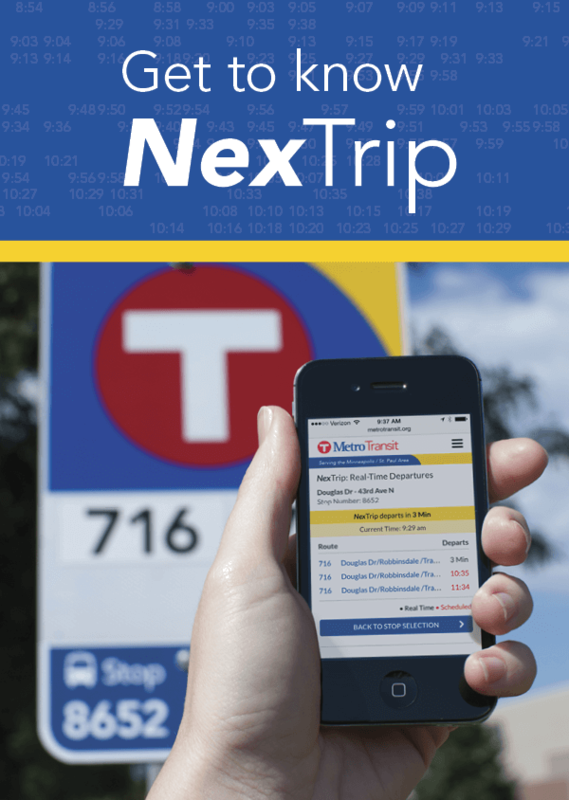 At metrotransit.org: NexTrip appears in the blue tools area on the right side of most pages. Choose your route, direction and location – or just use your Stop Number. Simply click on your stop on the interactive map. Mobile Device: At metrotransit.org/mobile, Use the “Find Me” tool and see your information right away. Call 612-373-3333: Press 1, say “bus stop” then state or enter your Stop Number or choose by route, direction and stop location. Text Message (SMS): Text ‘MT’ followed by your Stop Number to 27299. Example: MT50196 will give times for Stop Number 50196. Add a space between the Stop Number and a route to get times for that specific route. Example: text “MT50196 17” for Route 17 times at Stop 50196. Note: data rates may apply. Find Stop Numbers using the Stops & Stations tool or the Interactive Map. 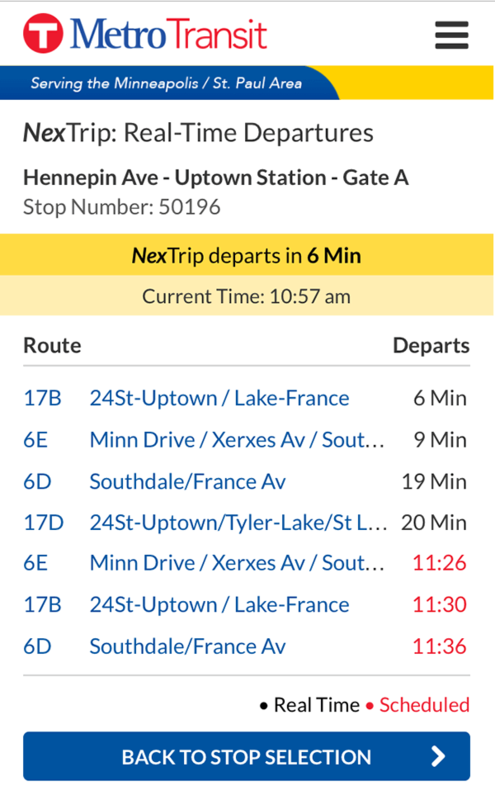 NexTrip provides real-time bus departure times for all Metro Transit buses and most regional buses to help you better plan your commute. Every bus has an onboard computer that tracks its GPS location. As a bus travels along a route, NexTrip tracks its location in relation to specific timepoints. It updates automatically every few seconds. If a bus is expected – based on its current travel speed – to leave a stop within the next 20 minutes, NexTrip displays in black the number of minutes to departure ("6 Min"). Outside the 20-minute window, NexTrip displays scheduled times in red ("2:17"). Note: Always arrive at the stop at least five minutes before the scheduled time. Because NexTrip tracks location based on stops along the route, if a bus has to make an unexpected detour off its regular route – for example, to avoid an obstruction or congestion – it will not be displayed in NexTrip. Until the bus returns to its regular route, NexTrip will display only scheduled times. * Departure times are estimates. Buses and trains are subject to delays based on traffic and other conditions. Always arrive at your stop 5 minutes before the NexTrip or scheduled time.